This cigar-style box is one of our popular packaging products from our turned edge box department. The NetBox™ is fully customizable from the outside wrap to the inserts in the box tray. 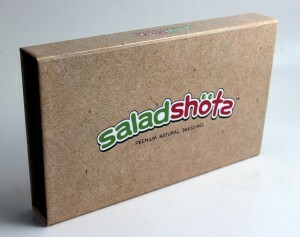 This turned edge box for Salad Shots shows just how versatile a simple cigar-style box can be. Mostly used for media applications or marketing sales kits, the NetBox™ has now entered into the realm of retail product packaging. 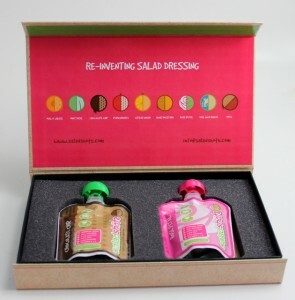 Salad Shots used their own graphic design and logo for the outside turned edge wrap which is turned tightly around durable chipboard, creating the look and feel of a hardcover textbook. Held shut with a magnetic closure, open up the NetBox™ and you will find Salad shots pouches held in place by a custom die-cut foam insert. 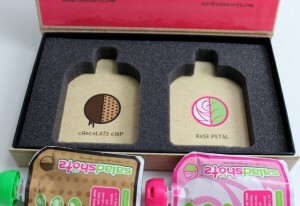 Each flavor that Salad Shots offers is displayed on the graphics printed on the inside liner. We love the design and their use of bright and earthy colors! Learn more about our cigar-style NetBox™.